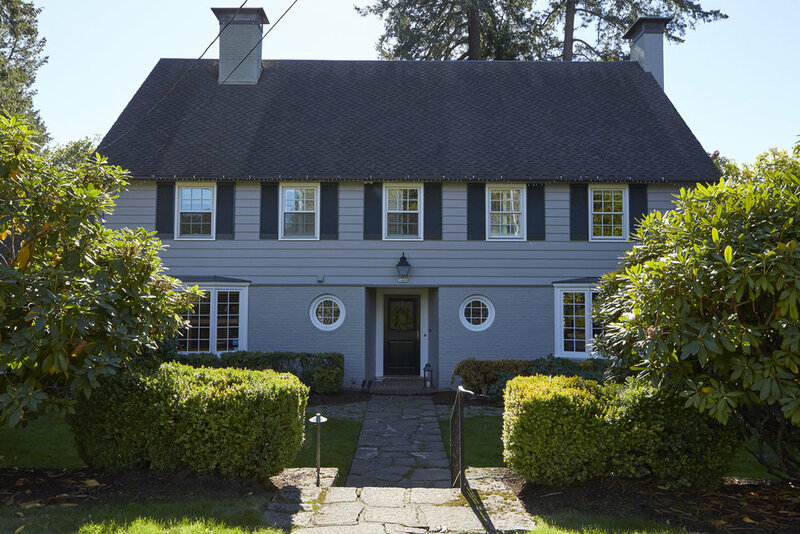 The exterior of this graceful 1933 Colonial Revival home tells the story of a compact and formal home. Step through the entrance - flanked by artisanal leaded glass porthole windows - and the narrative suddenly changes. The warm and inviting entry introduces a grand scale (nearly 6,000 square feet), luxurious home where tradition meets modernity in sophisticated comfort and style. Built in 1933 by noted architect Whitehouse (Morris H.) and Church Architects, the house sits on rare City acre (.96) and is home to Óli Gunnarsson and Ólöf Kristjánsdóttir, and their 9-year-old son, Gabriel. With 6 bedrooms and 5 and-a-half baths, this home’s more formal features are softened by a warm and elegant aesthetic. Period details appear throughout ornate woodwork, wall paneling, hardwood floors, two fireplaces, and a sweeping staircase, and give the home an old-world charm. The spacious entry guides you to the formal, yet comfortable living room with oak hardwood floors and paneled walls. A fireplace brings added light and warmth to this room, which, despite its considerable size, feels cozy. A card table serves as a gathering spot for the family, who enjoy playing games with their son and friends and family. A guitar leans near the sofa, waiting for another afternoon practice. Ólöf, who loves old homes with character, was drawn to this home for its fine old bones, and because it offered enough space to accommodate family and friends from Europe for extended stays. This is a family that values their outdoor time and have worked to maximize the outdoor living space with a stylish patio, raised-bed gardens, a brood of chickens, and lots of fun play spaces for Gabriel. Their appreciation for the natural world is beautifully integrated into their home. Shortly after Óli and Ólöf bought the home in 2015, the couple began a remodel, selecting new finishes and furnishings, including flooring, lighting, paint, wallpaper, and window coverings. Ólöf worked to develop an earthy and sophisticated Scandinavian aesthetic with a palette of soft neutrals, pops of rich red and deep plum, and subtle texture. Next, they tackled the kitchen and in an unexpected move, made the space smaller by removing a bump-out and adding a cozy, built-in breakfast nook. This decision brought in more natural light and provided more outdoor space for the next project: a gorgeous bluestone patio spanning the length of the house. The new kitchen sparkles with white marble countertops, crisp custom cabinets, and a sun-splashed, built-in breakfast nook. Together, Ólöf and Óli turned a dated, stuffy sunroom into a magazine-worthy showstopper with a generous skylight and a glass paneled sliding door that opens to the private backyard. Warm caramel and honey tones complete the look in hexagonal floor tiles, a woven carpet, and stunning cane chairs with modern lines and over-stuffed cushions. A study, complete with knotty pine paneling and bookshelves, and a brick-framed fireplace complete the bottom floor. The open staircase leads to the second floor with 4 ensuites including a master bedroom with an attached nursery or bonus room. Built-ins and a deck overlooking the peaceful grounds are featured in the master suite. The third floor offers two additional bedrooms, an office, and a fifth full bathroom, as well as a generous landing area with built-in bookshelves. This is a home that offers delight for the senses at every turn – including two adorable Duniway Elementary class art projects lead by Gina Benzien (crayon composite) and Tasha Bartley (tile) – just a few more elements of fun in this traditional and friendly home. Artist rendering by Nola Lee, Kindergartener .